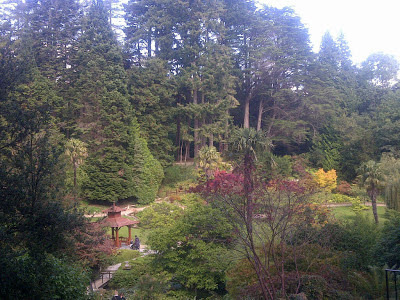 If you want to see a Japanese garden, don't go to Tokyo, go to Wicklow! The Wicklow Mountains, to the south of Dublin are a beautiful area to go walking and generally taking a trip out to the great outdoors. You can imagine with all the rainfall that Ireland gets it would be very green and lush. It is! However, I hadn't expected to see this beautiful array of colour! This the Japanese Garden in Powerscourt House, near Enniskerry. The stately home is famous for its gardens, the main section of which is modelled on those found at the Palace of Versailles, near Paris. Higg and I took a trip to this place and visited the gardens, which are extensive and incorporate various sections. The Japanese Garden was my favourite section - not just for the various rich colours, but also for its quaint location within the woods and its intricate pathways and hideaways that interspersed the gardens. It's like being in a mini maze, and you want to play hide and seek with your friends. Yes, it brought out the kid me!